Find hotel near Olympic And Sports Museum .. This museum is dedicated to the world of sports. With its focus on displaying the high-performance sport competitions, recreational sports, sports in general and sports for disabled people, this museum promotes sports values amongst those who visit it. Inside the museum, there are sport idols that share space with outstanding players. There is also an area for mass sport and major events which includes advanced technology and interactive multimedia installations. It has been named after Juan Antonio Samaranch since most of the emblematic part of collection was donated to this museum by him. There is a temporary exhibition hall that showcases sports as played in different civilizations. 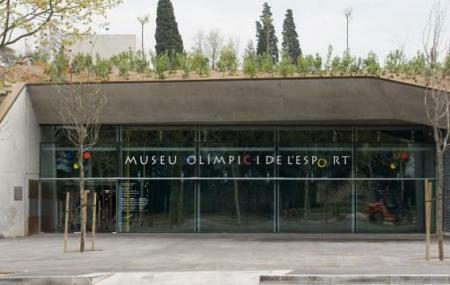 How popular is Olympic And Sports Museum Joan Antoni Samaranch? People normally club together El Raval and Museu Del Modernisme while planning their visit to Olympic And Sports Museum Joan Antoni Samaranch. Excellent to come and see where the Olympics was held. Lots of history and its great that you can walk around the stadium and grounds. I my opinion, one of the worst museums of the city, indeed it's boring and very bad structure. Tourists don't go if you don't want to lose your money. It's a shame, being resident that the city town has made that museum. If you just want to know something about the Olympics, more than welcome, but the relationship between the Omplymics and the city it is not found. However in the same time there are a big section about the person who brings the Olympics to BCN that nobody cares about. Please avoid it. Great experience at the Olympic museum, very high up so when you exit you get a beautiful view of the whole of Barcelona. Very nice building. There is bar at the entrance open to the public with terrible service. A lady kept shouting as we were a menace just because we were asking for drinks (which I expected to pay of course), the staff clearly showed their discontent on having customers around. The experience is spoiled by the stressed staff. Amazing venue to show the family, an open gate allows you to enter (free of charge) a small area and view the track and stadium with a small shop and cafè situated for convenience before walking through the park and waterfall areas constantly looking back at the stadium. The park area is clean and maintained but unfortunately starting show signs of age. Also close the museum another must before or after seeing the Olympic Stadium.